Featuring a BETA 58A? 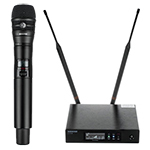 handheld wireless microphone transmitter, QLXD24/B58 combines professional features with simplified setup and operation. With an interchangeable BETA58A? 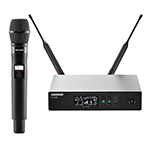 microphone cartridge, the QLXD2/BETA58A Handheld Wireless Microphone Transmitter is ideal for wireless vocals in presentation spaces, music venues, and houses of worship. Featuring an SM58? 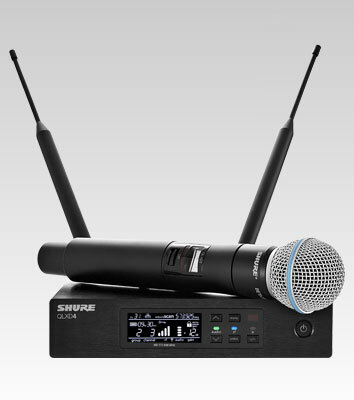 handheld wireless microphone transmitter, QLXD24/SM58 combines professional features with simplified setup and operation. With an interchangeable SM58? 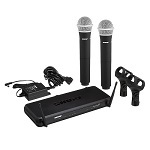 microphone cartridge, the QLXD2/SM58 Handheld Wireless Microphone Transmitter is ideal for wireless vocals in presentation spaces, music venues, and houses of worship. 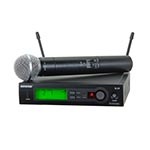 SLX Wireless Handheld System, includes SLX2/SM58 Handheld Transmitter and SLX4 Diversity Receiver. Preferred by touring vocalists and sound professionals. SLX Wireless Handheld Transmitter with SM58 Cardioid Microphone. Legendary Shure SM58? 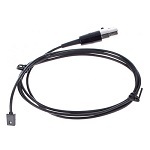 vocal microphone, tuned to accentuate the warmth and clarity of lead and back-up vocals. Consistently the first choice of performers everywhere. The SLX4 receiver brings unprecedented ease of use to wireless with Automatic Frequency Selection and Automatic Transmitter Setup. With included rack hardware and detachable antennas, it is ready for immediate installation right out of the box. Model SLX4L available with logic output for use with software echo cancellation and remote battery life monitoring. Logic-enabled transmitters include MX690 and MX890. 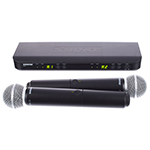 Includes SVX88 Dual Diversity Receiver, Two SVX2 Handheld Transmitters with PG58 Mic Head. RF Output: 1mW maximum Working range (Line of Sight)**: 18m (60 ft) The Low output power is mainly decided for China KTV installation. It allows installer to easily reuse frequency band in short distance without interference by large number of channels at the same floor / multi-floor.